I thought it might be a great idea to show you just what it is I use for my original oils on linen. It may better explain the detail that I use in each piece. I am not one to use large brushes. 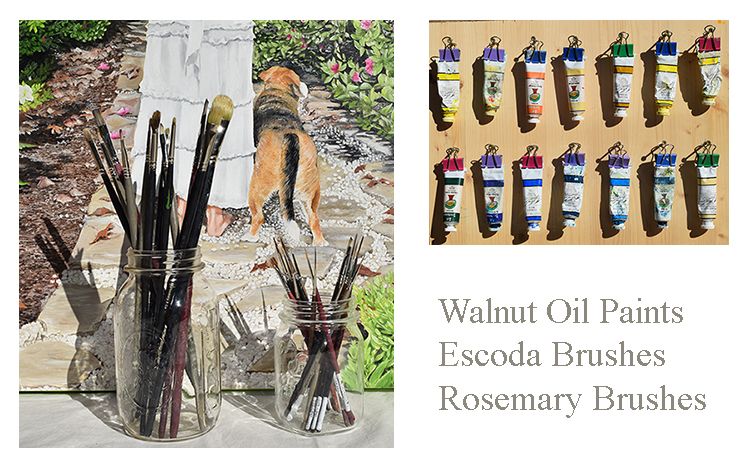 I use all walnut oil paints which dries slower and yellows less than linseed oils and I use no cadmiums or cobalts that are dangerous. The white I use has no titanium so the white in the painting is not "chalky". I spend hours just making sure that art detail is done just right. I also spend a lot of time waiting for paint to dry so I can continue. This is a process. I also use portrait linen which is smooth so the detail really shows up. Check back later as I will be adding more photos.